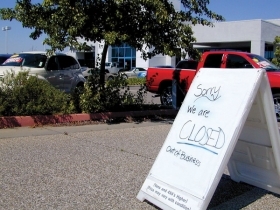 Folsom Lake Chrysler-Jeep: A closed store reflects Chryslers troubles. FOLSOM, Calif. — Just east of Sacramento lies the town of Folsom, the one with the prison that Johnny Cash made famous 40 years ago. These days Folsom has added a different sort of reputation: It's a hotbed of high-technology. For example, Folsom is now the site of an Intel r&d center and a division of Aerojet that makes rocket boosters. It also is home to the state's largest Chrysler LLC dealership, Folsom Lake Dodge. Last year, the store sold 1,280 new vehicles. Owner Carlos Hidalgo says his store sells more Chargers than the nearby Toyota dealership does Camrys. When it comes to pickups, Hidalgo says he outsells everyone in town. That's not bad for a Chrysler dealer in California, where the average Toyota dealership sold 2,030 new units last year — compared with 413 for the average Chrysler store. Indeed, Chrysler has hit the skids in California, and some dealership officials worry that it could be headed toward irrelevancy. Chrysler LLC's share has been shrinking in the past year. The automaker isn't as badly overdealered in California as in the rest of the United States. There are only 141 Chrysler LLC dealers in the state. If the recently announced closings take effect as planned, only 109 franchises will remain — less than either the Toyota or Honda brands. But despite Chrysler's California blues, Hidalgo remains cautiously optimistic. When other Dodge dealers stopped ordering cars, he ordered more. With Chrysler production down during the Chapter 11 proceedings, some vehicles are in demand. Hidalgo said he could sell more cars if credit were easier to come by. "We'll have 38 write-ups but can only sell 17 because we can't get the other guys financed," Hidalgo said. While Folsom Lake Dodge is still eking out an operating profit, next-door Folsom Lake Chrysler-Jeep has closed. The dealership is still waiting for the bank disposition of its inventory of 280 cars, which sit forlornly behind chain-link barriers and "No Trespassing" signs. Hidalgo said he would absorb the two neighboring franchises if asked by Chrysler, but he won't buy their real estate or buildings, which he calls "a waste of money." Said Hidalgo: "You don't need two buildings to cater to the clientele." Chrysler's market share has plummeted in the Golden State. From 2002-05, the Chrysler, Jeep and Dodge brands combined held 7.0 to 7.5 percent retail share, according to Experian Automotive's AutoCount market data. But since then, Chrysler's share in California has fallen sharply, finishing just above 5 percent in 2008. The share hit 4 percent in September and has barely recovered since, according to Experian. One veteran dealership manager in northern California said he fears for the future of all Chrysler stores in California. "Most Chrysler-Jeep-Dodge dealers around here don't have the financial strength to endure what we're going through right now," said the executive, who spoke on condition of anonymity. "Even those guys who did it right and have a few bucks stashed in a drawer." Jim Williams, owner of Don-A-Vee Chrysler-Jeep in the Southern California suburb of Placentia, said his new-vehicle volume dropped from 1,600 units in 2007 to about 850 last year. Sales are flat this year. But he remains hopeful about the pending link between Fiat and Chrysler. Williams, who started his career as a dealer selling Fiats, now may be seeing things come full circle. He says he is "one of the last profitable Chrysler dealers." His profit last month: $2,000. Said the one-time Chrysler dealer council chairman: "It's tougher for us in California."